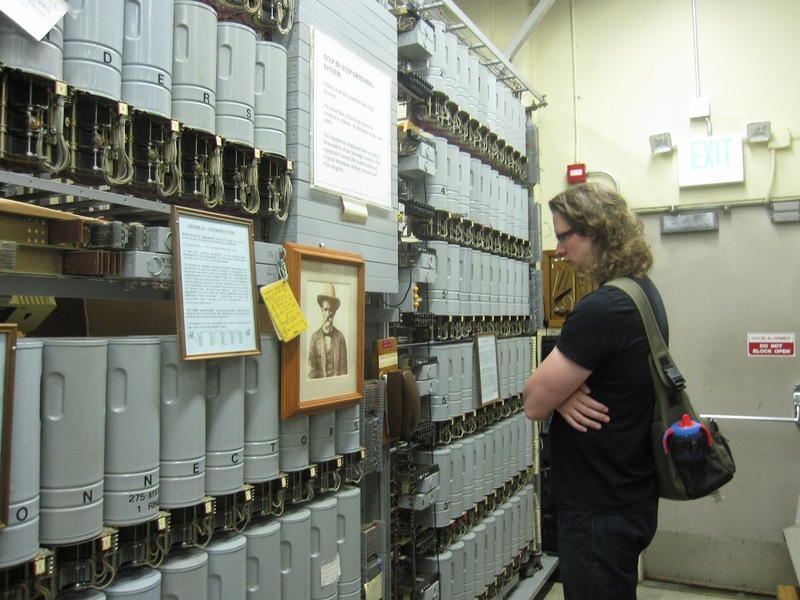 Yesterday afternoon we headed down to the Museum of Communications, which is located in the Georgetown neighborhood of Seattle. They're only open Tuesdays and the first Sunday of each month, so it's taken us a while to fit this one in. In all honesty, not the easiest of museums to do with a baby. Gareth was just fine, so I'd say okay for kids probably starting around age 3-4, depending on the kid. But Malcolm really just wanted to get down, crawl around, and get into everything. I did let him down a bit, but the floors were quite dirty, so his hands and knees were nice and grey by the time we left. I should've just kept him in the carrier the whole time, but it was really hot in there and we were both sweating within minutes of starting our tour. 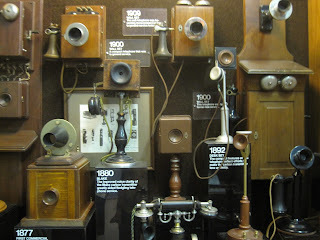 Anyway, the museum is full of old phone stuff (can you tell I don't know much about the inner workings of phones? ), as well as some other communications items. They have people there who can give you a quick tour of the upper floor, most of which I missed because Malcolm was fussing. But Ryan declared that it all seemed much more complicated than what he does every day. Some of the phones are connected with other phones in the room, so they can dial and show you how dialing would look at the central office and it gives you a chance to try out some of the old phones, which Gareth thought was quite fun. 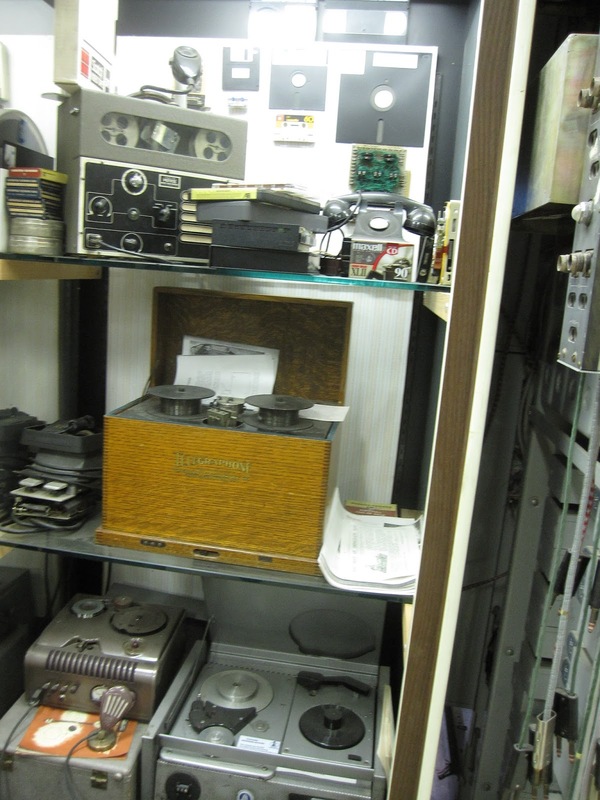 Other items there - old teletypes, dictaphones, oldish computers, telegraphs, army field phones from WWII, operator's desks, etc. 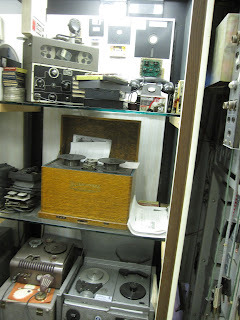 Magnetic recorders (answering machines) - the messages were recorded on thin metal wires. Too expensive for households, but used by businesses. 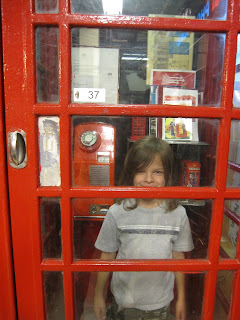 Gareth thought being inside the British phone box was fun - except that the door was a bit too heavy for him to manage himself. Apparently the phone company for the area - Western Electric - also got into manufacturing household goods such as irons, clothes dryers, vacuums, etc. for a while, so they've got some of those as well. Ryan entertained himself on the second floor by reading the Bell System Technical Journal. 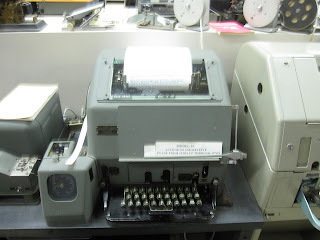 An especially fun place to visit if you're really into that stuff, but even if you're not, it's quite interesting to look at all the old communications devices.